Digging the Digable Arts Festival! 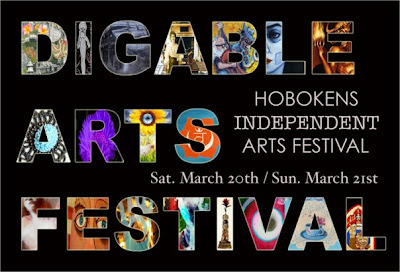 So excited to be part of this 2 day festival being held at the Monroe Arts Centre in Hoboken weekend of 20 & 21 March. Check out the promo video here where I get a few words in! There’s going to be over 60 artists, musicians & film makers participating. I’ll be there with some friends creating a series of collaborative paintings and encouraging the crowd to participate! Ill also be exhibiting paintings, prints and other items….sooooo excited! I’ve not really collaborated on a painting before so we are just going to get our hands dirty, get the crowd involved and have lots of fun! I plan on wearing my apron from An Artful Journey as its far too clean for my liking! I’m also amazed to have my space in the main room where the bands will be playing so I’m really interested to see if our styles, colours and images change with the different genres of music filling our senses throughout the two days. I find chill music inspires the most creativity when i paint or collage…what do you think? Do you find your art changes if you listen to different music? this sounds simply amazing….oh how i wish i could come to this event and participate!!!! yes. yes. yes. to music and how it affects my creativity! music is a driving force for me and it is my therapy!! Saw the mention that Kelly Rae gave you and your blog on her blog and had to visit. I saw that you abandoned your TV recently in favor of more time for creativity, (I cut the cable in 2007 and have not regretted it). I was at Artful Journey as well, in Nina's class…somehow we did not meet at meal times, <) …. but then there were a lot of people at this retreat. I really like your painting Greenlife or Greylife. Maybe we'll meet at a future Artful Journey. You have totally grabbed your creative life by its horns! This event looks like so much fun – and looks like your creative community is just going to keep on growing! ohhhhhh how i wish i could be there! it was a JOY to hear that sweeeet voice of yours again. 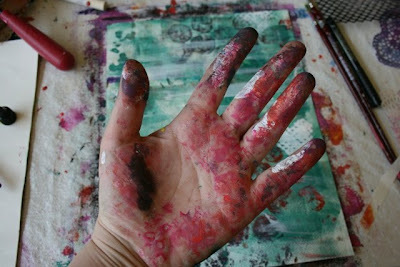 love that you are going to be collaborating….how fun and brave at the same time. loved seeing you on kelly.s blog. it.s surreal when you find yourself on there huh? OH MY GOSH!!!! IS THAT REALLY ME? such an exciting time in your journey. looks like so much fun! can't wait to see more photos. you do such beautiful work! thank you for being so inspiring:) best wishes to you! what a sharp video! Hope it was a smashing event for you!